Searching the net for that perfect pattern can be hard, especially when all of the links do not come with photos of the finished products. I intend to share some of these patterns, and (hopefully) those of my own invention in the future. Welcome to ChemKnits, the knitting blog of a Biochemistry graduate student studying mechanistic enzymology. Today, I will link you to some of my favorite old projects. 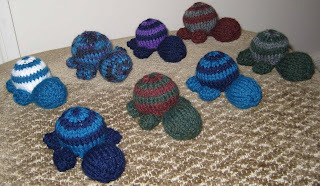 These turtles were so cute that I needed to create an army of them! 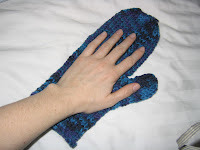 They are about two inches long, and are a fast and easy project. I think that if you added a loop to the shell, they would make great Christmas ornaments. This would be a great toy for a child (or in my case, my boyfriend who "collects" turtles!) 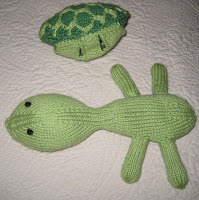 Knitpicks.com has Sheldon kits for sale so you can turn Sheldon into a sheep or pirate. Knit Picks Shine Sport yarn recommended for this project is sublime, soft and easy to work with. So the colors got corrupted when I uploaded this image, but the general point is there. This knitting book has some great small projects that work well for gifts. What better to give an apartment of guys than homemade beer cosys? This project works well with left over yarn. 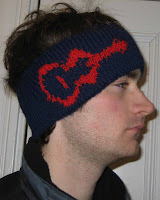 I adapted the following guitar pattern chart (http://vickidesigns.homestead.com/zachsguitar.html) into a warm winter headband. The headband was knit in the round with worsted weight Wool ease yarn. A purl row at the midway point helps the headband fold over well. 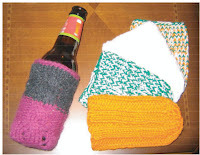 What a perfect housewarming gift, and also a great way to use up remnant wool yarn. 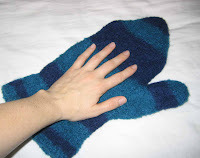 Be careful, if the oven mitt gets wet, it is no longer insulating! Before felting, the length was 19 inches and the width was 7.5 inches, final product 13 inches high, and just under 6 inches wide. 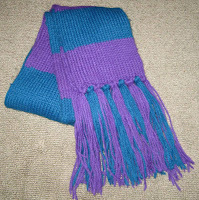 Dimensions (without fringe): 5.25" x 64"
Since the scarf is a big tube, it ends up being extremely warm. There is the added benefit that minimal blocking was required. 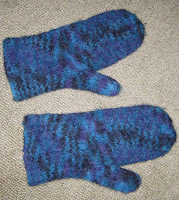 They are super warm and cozy, and hand felting ensured that they would, in fact, fit like a glove! I made a couple small changes from the pattern: no fuzzy stuff at the cuffs and I knit with only one strand of yarn at a time. A 100g ball of worsted weight wool yarn is more than enough for this project. That is all for now, the archive will continue at a later date! First Post! Yeah that's right I'm a knitting chemist forum troll.